Finally Beanie went for a trial lesson. He looked forward to it actually but it didn't turn out the way he expected it?! He knows the coach, teacher Christine. What he didn't expect was the kids were a little too 'noisy'. We were early so he got some time to warm up before other students arrived. He was fine till the lesson starts... I saw from outside the room the kiddos were making lots of noise. 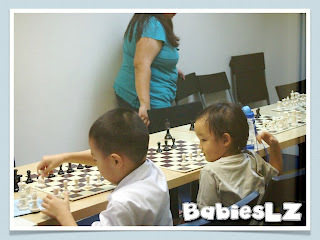 After the lesson, I was told that he told teacher Christine to "keep quiet"! I was shocked! I think he was overwhelmed with it. I told him earlier that he should be quiet when teacher talks and follows instructions. Probably there were too many people talking at the same time that he couldn't take it. I'm sorry Christine. Teacher told me he may not be ready at the moment and I agreed. the kids were few years older than him and the teacher may not be able to cope, handling different age. 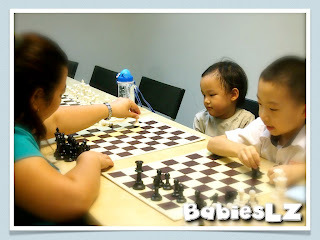 Well, we'll see how it goes and wait for a group lesson which is suitable for his age. Meantime, he will learn from his brother whenever he wants to.